It doesn't take long after learning to play Tic-Tac-Toe to realize that once you've mastered the basic tactics, your games will end in an infinite run of ties. But Pressman Toy has done the impossible and made Tic-Tac-Toe actually sound interesting again by upping the challenge with the introduction of a third dimension. 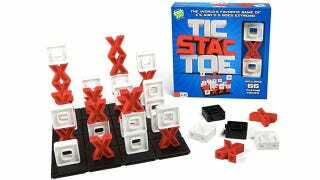 Tic Stac Toe now has players stacking their Xs and Os in addition to arranging them in 2D space on the game board, which itself has been upgraded from a 3x3 to a 4x4 grid. The basic gameplay is the same, the first to get four of their Xs or Os in a straight line wins, but keeping track of your opponent's strategies is now a whole lot harder.